I've read quite a few books by Abigail Reynolds; she's written a number of variations on Pride and Prejudice, changing certain elements and exploring how it could have affected the path of the story. However, this was the first thing I've read by her that is set in modern times and I wasn't quite sure what to expect. This is is modern day version of Pride and Prejudice. Cassie, who is a marine biologist, meets Calder, who is the rich son of a congressman through a friend of hers starting a relationship with a friend of his. Cassie and Calder's relationship starts off badly when he refuses to dance with her (sound familiar?!) but it's not only that which prejudices her against him. Firstly, she has been badly hurt by a previous relationship breakup, and doesn't really have much trust in men, she has a few secrets that she's been keeping from everybody and she also doesn't think it's within the realms of possibility that somebody from Calder's background would be interested in her for anything other than a quick fling. Calder's father is a Republican senator for whom image is everything, and the senator is also pretty anti-science, so when Calder finds himself interested in Cassie he fights it, knowing that she would be completely unacceptable to his family. Obviously, since this is a modern update of P&P we know that Calder feels more for Cassie than she realises but the penny doesn't drop for a long time. In P&P, Lizzy feels sorry for Darcy's feelings once she's digested his letter, and she has unwittingly led him to have feelings for her, whereas Cassie has both given active encouragement to Calder and been very cold towards him to preserve her own feelings without any thought for his, so she has more to feel bad about. Plus Calder's version of the letter spells eloquently how much he cared, and how she's basically ripped out his heart and trampled all over it. One thing I think Abigail Reynolds generally does well is the type of pain which has you gripped to your kindle, and you feel bad for both Calder and Cassie. But even when things begin to look hopeful they will have some family obstacles to overcome. I thought this was an interesting update. 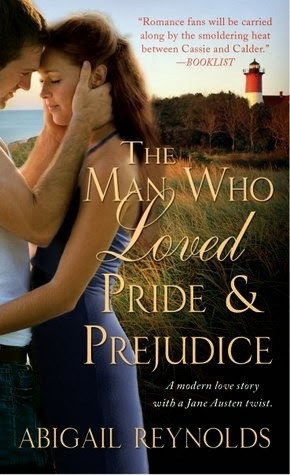 A lot of the modern versions of Pride and Prejudice that I've read have very young protagonists but I liked them being a little bit older, and I also thought it was clever that instead of both being misled by vanity, instead they were misled because they both saw themselves as unworthy in some way - Cassie can't see a rich man staying interested and Calder has never felt loved by anybody. I thought him being part of such a ruthless, image-conscious senator's family gave an understandable reason for Calder to fight his attraction to Cassie. I liked the insights into the mechanics of Cassie's work too. On the flipside, I found it frustrating that neither of them would talk to each other about how they felt for so long. There is a lot lacking in Mr Darcy's courtship of Lizzy but at least at Hunsford she knew what she was turning down; at this couple's Hunsford moment it's not at all clear what Calder wants from her. Also, Darcy gets the letter straight to her, Calder's 'letter' is delivered in a much more roundabout fashion and leaves a good deal to chance. It's understandable because he has so much less self-belief than Darcy, but it's still frustrating. It's good that by the end of the book we see these two work through some of their baggage and family issues, particularly Calder. I enjoyed this book and I'd recommend it. There is another book in this series, 'Morning Light' which I believe is influenced by Jane Austen's 'Persuasion', which I'll try and read soon.